With 14 different room types in our collection you will find a room that fits what you are looking for! 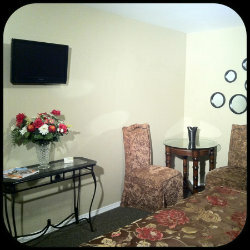 Each of our rooms are going through remodeling upgrades keeping them fresh modern and comfortable. This recently refurbished room is elegantly appointed and perfect for those looking for either a comfortable stay alone or a romantic get-a-way. Find execptional comfort on the pillow top mattress. These Rooms feature refrigerators, microwaves, and flat screen television. Our standard double full rooms have been recently refurbished, and feature two full size beds, microwave, refrigerator and flat screen televisions. This room is perfect for those who want self suffeciency. 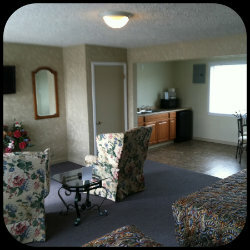 Make yourself at home in the sitting area, at the full dinette, or in either of your two comfortable queen sized beds. 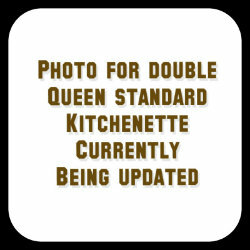 The Kitchenette is equipt kitchen with a full size refrigerator, stove, microwave and flat screen televisions. Deluxe King w/ Tub This recently refurbished room is elegantly appointed and perfect for those looking for either a comfortable stay alone or a romantic get-a-way. Find execptional comfort on the pillow top mattress. These Rooms feature refrigerators, microwaves, and flat screen television and of course a bathtub. This recently refurbished room is perfect for those who want luxury with self sufficency. 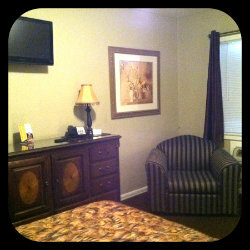 Make yourself at home in the sitting area, at the full dinette, or in either of your two comfortable queen sized beds. 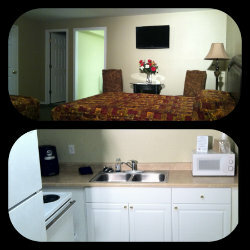 The Kitchenette is equipt kitchen with a full size refrigerator, stove, microwave and flat screen televisions. 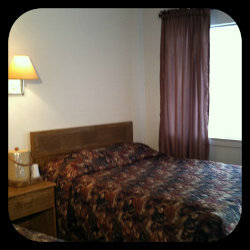 This recently refurbished room is tastefully decorated. 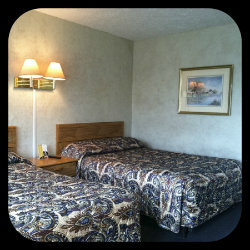 Find execptional comfort on the pillow top mattress a large bathroom and tub. These Rooms feature refrigerators, and flat screen television. 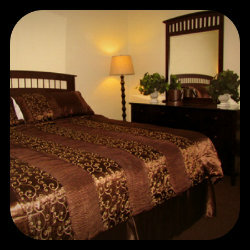 Enjoy this comfortalbe room with two full size beds, refrigerator, microwave and television. 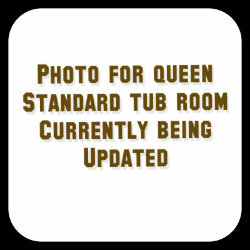 Sooak in a tub in this room with a queen sized bed and flat screen televison. These are large spacious rooms, with pleanty of room to move around. 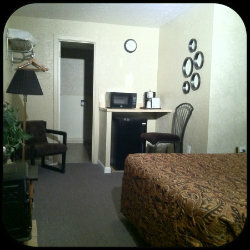 Tastefully decorated and feature flat screens, microwaves, larger refrigerators with extra dining area. 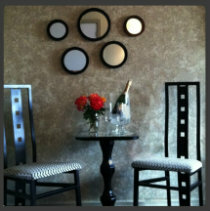 This recently refurbished room is tastefully decorated. Find execptional comfort on the pillow top mattress. This room is elegantly appointed along with refrigerator, and flat screen television. The bathroom is extra large and has a tub to soak! Cancellation Policy: Cancellations made 7 days (or more) advance notice will receive full refund. Cancellations made 7 days or less, will be charged one night's stay. Cancellations made 24 hours or less - no refunds will be given. *By making your reservation with us you are agreeing to the terms of the cancellation policy. Groups: For larger groups please feel free to contact us directly. Contractors/Extended stays: We accommodate temporary contractors or those working in Moses Lake and Surrounding communities. For additional information please contact he front desk.